Can you believe it’s 2019? Welcome to the future. While our closets aren’t full of chrome spacesuits (the metallic puffer coat trend is darn close) and we aren’t hopping on regular Space X flights to visit the relatives on Mars (yet), lots of today’s tech—in the form of data mining and analytics—is more advanced than the sci-fi films of my not-so-distant youth. These days, wholesalers and retailers can go deep on consumers, harvesting demographic and behavioral data about their shopping habits, product preferences and post-purchase sentiments. Machine learning enables them to collectively know consumers better than they know themselves, which is intriguing—albeit a bit creepy—just like any good sci-fi flick. Every customer with a smartphone (and that’s nearly everyone these days) is a walking, talking, web surfing trove of data. Likes, searches, purchases and page views all leave a breadcrumb trail for marketers straight to the minds and wallets of millions. Emotional data, eye-tracking and face recognition are some of the latest consumer tracking upgrades being introduced in the never-ending quest to transform data into dollars. Even consumers’ evolving Google search language is adding to marketers’ data mining capabilities as it becomes increasingly personalized. Google data shows searches for “should I” and “do I need” have jumped 65 percent in the past two years; searches for “can I” are up 85 percent. Despite privacy concerns, this intense personalization phenomenon, better known as “deep retail,” is likely here to stay. In fact, many consumers expect brands and retailers to offer goods tailored to their tastes and needs. Research shows over half of consumers now expect to receive a personalized discount within 24 hours of making themselves known to a brand, and an even larger percentage express frustration at impersonal shopping experiences. These days it’s all about the seamless transaction, and that’s not just fulfilling late-night cravings at the tap of the smartphone or a quick command to a voice-controlled device. Technology today is helping to eliminate shopping friction, so consumers have little reason to leave the house. But despite enormous strides in this area, the conversion rate for online shopping remains at just 3 to 4 percent. The conversion rate of consumers who venture into a physical store? A whopping 35 percent! You don’t have to be a data analyst to know that equates to enormous opportunity for traditional retailers. From smart mirrors at Neiman Marcus to experiential services like manicure bars (DSW), personal stylists (Nordstrom), juice bars (Adidas), floor pianos and human toy soldiers (FAO Schwarz), and “S’mores and Santa” and “Beer and Bacon” in-store events at Yellow Turtle in Stowe, VT (What’s Selling, p. 38), there are countless ways to draw shoppers across the threshold. The initial shock and fear caused by this epic retail shakeout is quickly being replaced by an age of re-imagination and renewal. This is a time of great retail rebirth—seeing ideas leap from the planning phase into reality. Now it’s about which concepts and formats might have legs—and that sure beats keeping tabs on who failed and why. Besides, we know why: too much overhead, too little service and selection, stale décor and outmoded formats were a recipe for failure. I welcome this retail revivalist period. In the meantime, some business basics remain as relevant as ever. For example, knowing which brands have the best margins and what categories have the best sell-through is common sense but critical. Yet it’s surprising how many retailers don’t know. It starts with having a detailed open-to-buy plan and sticking to it. Put 80 percent of the budget into brands with strong margins and earmark the remainder for new brands and/or categories. You can achieve the same profit by selling $200,000 at a 50 percent margin as you can by selling $250,000 at a 40 percent margin. The difference is an extra $25,000, useable for fixed costs, salaries, advertising, data harvesting, etc. It’s amazing how a simple approach can boost a bottom line. Another rule of thumb: Find a niche, focus and stick to it. A curated and personalized shopping experience represents the only viable alternative to the “everything store,” a.k.a. Amazon. Suzanne Schwartz, chief creative officer of luxury outerwear maker SAM and the subject of this month’s Q&A (p. 8), reveals how the company’s “stay in your lane” approach has enabled it to grow steadily and profitably over the past decade. And she foresees plenty of growth ahead—in outerwear. Schwartz and her husband (Andrew) know of what they speak: They’re the founders of Andrew Marc outerwear. The story of the empty nesters’ second rodeo is a good read. On that note, here’s to a year of inspiring stories about those boldly going where no childrenswear businesses have gone before. They’re rising to meet the challenges of today and tomorrow. They represent new frontiers in our industry. To borrow a famous sci-fi slogan, may they live long and prosper. 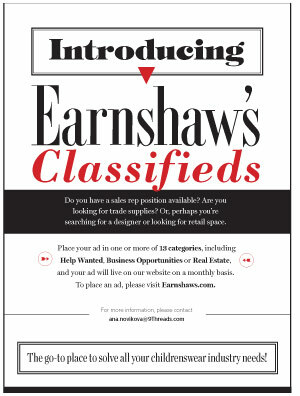 We here at Earnshaw’s are honored to share their stories, just as we have for more than 100 years.